Llwydiarth Fawr is a fine example of a Georgian mansion, home to Margaret and Richard Hughes, combining the friendliness and hospitality of farmhouse accommodation with the ambience of a country-house hotel. Set in over 800 acres of rolling farmland LLwydiarth Fawr was once the home of William (Klondyke Bill) Jones who became the Mayor of Bootle. This splendid property still has the aura of a Welsh Victorian country house with its bright facade and well maintained gardens and offers quality mixed driven and walked up shooting on the surrounding farm and woodlands. Llwydiarth Fawr is the holder of the Wales Tourist Boards coveted "exceptional" five-star grading - one of the very few such accolades to be awarded in Wales along with a Warm Welcome award. Margaret is a past winner of BBC Welsh Farm Wife of the Year Competition. Llwydiarth Fawr is recommended in many guidebooks including Trip Advisor and continues to be awarded with praise from guests. "Having stayed for the 3rd time(2006/2007/2009) this time 4nights, once again Margaret, Richard and son David the hosts have as always made us most welcome and spoilt with their breakfast(15 type of cereals, fresh fruit salad of raspberries, strawberries, blueberries, pineapple, melon, dried fruits, full cooked welsh breakfast, fresh tea and coffee, white and brown bread and more)." "This is the most comfortable, friendly, bed and breakfast establishment that I have ever stayed in. It is a working farm and the Georgian Manor House is set in the most beautiful countryside. We were booked in by friends as we were attending a wedding nearby and had no idea of the pleasant surprise that was waiting for us." "Myself and my husband spent our honeymoon at one of the self catering cottages... we enjoyed it so much that we returned for our first anniversary. Margaret and David were the perfect hosts and everyone we were acquainted with were really friendly. It was such a nice relaxing experience and very reasonably priced. Standards were superb." Llwydiarth Fawr's central location makes it the perfect base from which to explore all of Anglesey. 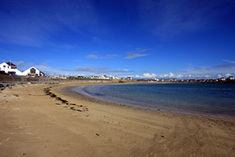 Historic Beaumaris and Plas Newydd, Sandy Trearddur Bay and Rhosneigr, spectacular South Stack and the coastline around Moelfre and Benlech are but a short drive away. The Britannia Bridge across the Menai Straits is close by too, putting Snowdonia, Portmeirion and the attractions of Conwy, Llandudno and Colwyn Bay within easy reach. Nearby Holyhead is the main ferry port for Ireland. Crossing on the fast ferry - combined with the short train link into Dublin or a coach excursion into the countryside of the Emerald Isle makes for a tremendous day trip.